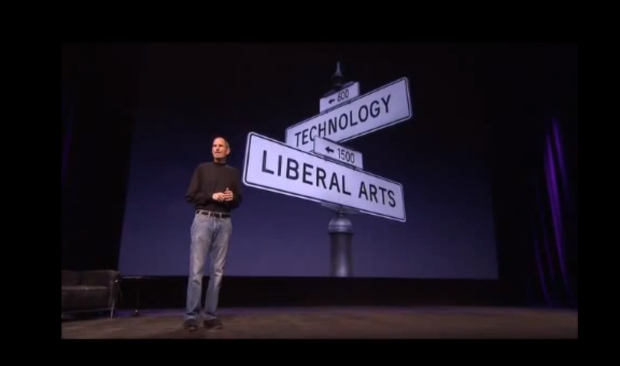 Steve Jobs famously said that Apple stands at the intersection of of Technology and the Liberal Arts. He said it more than once because he thought it was an important distinction of the company. In an intuitive way, the message may have gotten through to the average person, but I don’t think professional observers and managers of technology have quite grasped what he meant. It’s not a glib throw-away marketing phrase. I can imagine many other, more evocative ways of saying that Apple blends the hard and the soft; the heart and mind, if you will. His choice of words makes me believe that he meant it as a fundamental blending of two disparate and considered-opposite concepts, rather like yin-yang: things which do not naturally mix but which are complementary, interconnected, interdependent, and give rise to each other. This interaction however is not well understood and even more rarely exploited. The reason they don’t mix well in business in particular is that individuals are typically not trained in both. Our education systems (from where these phrases originate) are unwilling or incapable of providing us with a grounding in both, so individuals tend to absorb only one or the other. But it turns out that the interaction between these nominal opposites have determined our world to date and will continue to determine our fate. A cursory review of history shows that the “soft”, perceptive and feeling-based disciplines always combined with the analytical and judgmental to create a future which neither could create alone. I note how Apple uses this combination to an advantage and have also used this methodology myself to understand and sense the future. Taking this method further, I would like to share it with others. I would like to recognize some faint but powerful patterns and bare some of the more audacious conclusions of my analysis. The method chosen is a forum we are convening called The Post Modern Computing Summit.